Everyone knows that without countless volunteers, KP’s Cookie Café would not be able to deliver that little bit of home that the Midshipman look forward to each week. Every week dozens of cookies travel across the country to their ultimate destination; the stomachs of our Midshipman. Come to think of it, there is probably some project in there for a KP Intermodal Major! Volunteers come in all categories. There are those that make the trip to KP each week, those that bake and mail cookies and those that make donations to the Cookie Café program. However, there are a small number of KP Parents who live outside the continental US, who cannot participate in cookie baking because the mail takes too long to deliver cookies fresh. So when Casey Roth and Josh Sindorf (KP 2013 B-Splitters) found out that their assigned ship would stop at the port of Naha in Okinawa Japan, where Casey’s parents are stationed with the US Navy, Casey’s mom, Lorene, seized the opportunity to finally bake cookies for the KP Midshipmen; even if it was only two of them. The weeks leading up to the ship’s arrival were a flurry of activity. Recipes were researched and test batches were baked. To ensure that only the best recipes were selected, all cookies and treats were dutifully quality controlled by Lorene’s husband, Michael, and dog, Faline. Once Lorene found out the port arrival date, then the baking began in earnest, which included enlisting a friend who baked some coffee cakes. A rare e-mail from the ship requested that a favorite treat be provided. On the day the ship docked, the final tally was three cakes, two dozen muffins, 10 dozen cookies and a quick trip to the base commissary to purchase bread machine supplies. After a quick 8 hours in port, our two globe-trotting KP Midshipmen returned to their ship loaded with boxes and bags. All in all, we'd say it was a global success! 4450 Dozen/This Year's Last Hurrah/Cookie Cafe on YouTube! 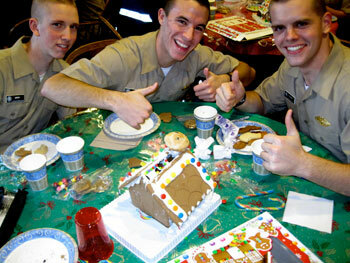 What fun it is to see the Midshipmen unwind as they take a break from studying for finals. We kept the music lively and had lots of bags for the Midshipmen to take cookies back to their rooms for studying. What is fun is to realize that Cookie Cafe is not just for the Midshipmen. When graduates come back for training, or to visit, when students are between ships they come to Cookie Cafe to socialize and visit with their friends. One Mid told us this week that there is almost nothing at Kings Point that is for socializing so Cookie Cafe is extremely important to all the students. Some may wonder why we bake there when we have enough cookies come in. I tried not baking and students were upset as they couldn't smell cookies baking when they came in. So, we bake, and the students are happy. This week we had lots of help. Of course we had Betsy Carbonne, Martha McCann, Johanna Essex, and Kathy Parks. All of them except Johanna, Gene and me have students attending KP. This year things have become very easy. We have all the glitches worked out: we have a freezer, and two cabinets at the Academy, and the parents are doing their big part of baking the cookies. Although this was our third year of Cookie Cafe, and the number of students continues to increase, it was our easiest year. Gene and I have had more time to just be there for students who need to talk, need counseling or encouragement. I just want to say THANK YOU, PARENTS, FOR A JOB WELL DONE. Most of you never have the fun of coming and seeing first-hand what you are a vital part in making happen. You have no idea what an important part of the Academy Cookie Cafe has become, and it's because of your sacrifices. I don't know how to thank each one of you enough. We just had our last Cookie Cafe. I do not have one during finals as students are leaving, packing up, and parents groups bring in bootle bags for them. We will start up on Sept 16th. The reason for that timing is that many of you still have other kids home and not back to school yet, vacations are on, and the weather is hot for baking. By Sept 16th everyone is ready to begin again with this adventure we are all in. Cookie Cafe is on YouTube! 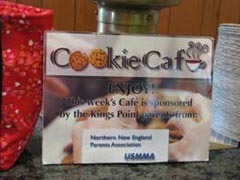 Kings Point Spotlight - Cookie Cafe. I have had a number of schools investigating what we are doing. They want to see if they can start it at their school. KP Cookie Cafe has achieved the perfect balance as a three-legged stool, YOU, MUFFI GRINNELL, AND THE ON-SITE TEAM - we're working very efficiently, don't you think? “Muffi, it’s Tuesday afternoon and we haven’t had one cookie arrive for Thursday’s Cookie Café!” I asked, in a panic. Facing the big day with over 300 mouths to feed and no cookies in sight makes me a little nervous to say the least. So began a fun and interesting Cookie Café, when Anita and Joe Koval took on the entire Cookie Café by themselves! The Kovals baked madly at their home in Houston, while Grandma in Oklahoma City pitched in with more cookies to be picked up en route. Anita wanted to try many different recipes but initially baked only three of each kind so Joe could taste test them and give his approval before she finished baking the whole batch. Talk about quality control! Because of that special testing method the cookies were all exceptionally unique and delicious. At 9 am, a car leaving a mouth-watering aroma in its wake, drives up to Land Hall with the most interesting cargo. 100 dozen cookies, stacked 6 alumnium pans high and 5 rows across. They were all tied in with the seat belt wrapped around the precious pans. It sure looked like a terrorist contraption, I’m glad they weren’t stopped and inspected by hungry authorities! Typically it takes 4 to 5 of us 3 hours to unbox, unwrap and label the cookies each week. Since these cookies were in pans already, all we had to do was label them with the special Cookie Cafe tent cards. We had a much easier morning of getting the cookies ready for display. It was a breeze! We ran into an interesting dilemma. 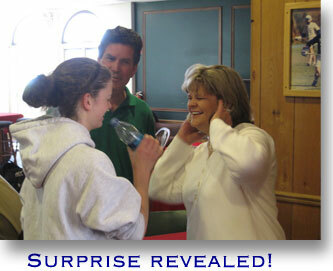 Anita and Joe wanted to surprise their daughter Kristin, and didn’t tell her that they were the sponsor. They assumed, of course, she would just show up for Cookie Café like she usually does. When the afternoon was almost over and Kristin hadn't stopped by, we all got a little nervous! Munching Mids caught on about the surprise, and students set out looking for her. Finally, Kristin showed up and immediately started looking for the cookies that she knew her sister had sent. In her focus to find her sister's name on the tent cards, she overlooked every card that said “Lovingly Made by Anita and Joe Koval.” Finally, with the Chaplain helping a little by pointing her in the right direction, she turned around and saw her folks. What a surprise!!! The Kovals loved Cookie Café, and were impressed with three things as observed by Joe: 1). how smoothly it runs; 2). how many students come out; and 3). how many cookies the students put on their plates!! They loved it so much that Anita announced she is going to do it all over again in the fall. I turned to Joe and asked him if he was okay with that. He grinned and said he guessed he was in for more driving and taste testing new cookie recipes. (Good sport!!) Thanks Anita and Joe for a labor of love well beyond the call of duty. Your cookies were wonderful, just ask all the smiling Midshipmen. Also answering well above the call of duty is Kristie Sindorf who is a regular at Cookie Café. At 5:30 am, she boards a train in Lancaster, PA, rides to Penn Station in NYC then takes the train to Great Neck. At 5 pm she reverses the trip and takes the long ride home. Thanks Kristie!!!!! This week, the other women who came to help proved what a small world this is. Kathy Parks is from Oklahoma, and the Kovals used to live in the same city that Kathy lives in. In fact, Kathy knew the doctor who delivered Anita’s three babies, because Kathy is an OB/GYN doctor at the same hospital!!! One final funny incident I want to share. With increasing attendance, we are expanding Cookie Café's spread, using tables in the other parts of Land Hall and all the picnic tables on the lawn. I ordered more of our beautiful red tablecloths with a generous donation from the Southern New England Parents Association (thank you!). They didn’t come within the expected time frame, so I called the company. They stated that UPS had indeed delivered them - yet they had not arrived at my home. Puzzling! Then, with a chuckle, I got an idea and called the Chaplain who has a key to the freezer at Kings Point, and there they were. We have developed such a great system with so many cookies arriving all the time. Each week, we pile all the boxes into the big freezer in Land Hall, and the tablecloth box looked like a cookie box. They had been “frozen” for two weeks in the freezer!!! Please join us if you can, you are always welcome. We have a lot of fun working together. It’s also so rewarding each week to watch the Midshipmen. They love it. It just amazes me how the extraordinarily wonderful KP parents never fail to let a Cookie Cafe get cancelled due to a lack of cookies. They always come through with a plan, even when it's down-to-the-wire, white-knuckle time! "Saw that there was a need for volunteers still for Cookie Cafe and was interested in participating. How and when can I help. Need all the details you can give. My name is Cathy, and my son is Midshipman Steven Webb, third company, 2013. His little sister and I look forward to your response. Have a great day!" "Our whole family will get busy, a nd one of the ladies from our church is going to contribute also! And we will plan on having the need met. 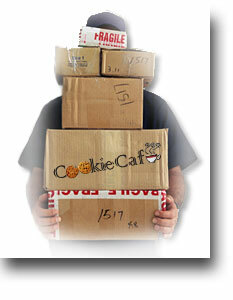 We'll send at least 8 different kinds of cookies, minimum of 2 dozen per kind. My daughter is looking forward to it. Thank you so much for all you do at the Cafe'. We will ship on Saturday so they will arrive to Carol in time. Thanks for all your help and the time and effort you give to our Midshipmen to give them a piece of home. Next year maybe I can enlist even more help! I'll be planning! I have a sister in WY who loves to bake. Just takes a little longer to ship from there." "We mailed off the 51 dozen cookies yesterday. It was a wonderful couple of evenings with sweet aromas drifting through the house. We tried a new recipe that was so good we had to bake a few more to cover loss that occurred as we passed the table." "Thanks for all your assistance in our first endeavor of Cookie Cafe'. Hope you enjoy the pics and that some can assist in showing the joy of participating in KP Cookie Cafe'. If you know the status of the June date's need, I will try to recruit." Of course a HUGE thank you goes out to the Webb family for jumping in and literally saving this day. By the looks of Steven's energetic young sister, it's no mystery that their efforts went off without a hitch! And how they can take a step back, slow down and relax for a short time each week to refuel their spirits, boost their morale and make their tummies very, very happy! Mom Guest does such an eloquent job with her special stories of each Cafe's unique flavor and touching events. And it is very important to those of us who organize, that we convey the message to parents so you know just how much Cookie Cafe means to the Mids. Recently a KP mom living in Okinawa has offered to have a special Cookie Cafe flag made. 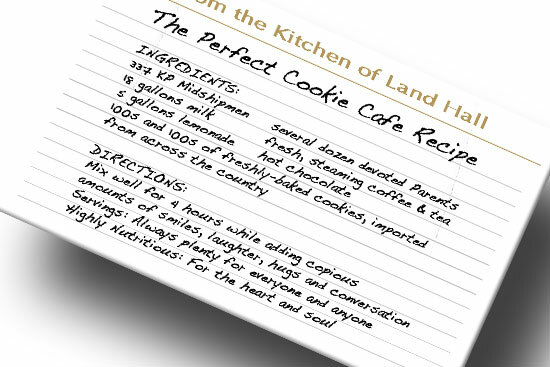 It will be flown outside Land Hall each week that Cookie Cafe is held to let the Mids know they have something extra special to look forward to. Yet another creative and wonderful idea that builds the specialness and family of Cookie Cafe. With this academic year end already in sight, we hope that in the next year and the years to come, parents will continue to support Cookie Cafe with their generosity. I promise to keep working the website and keep you all up to date. And as always, suggestions are most welcome! We had a great time! The weather was looking bad and our train was rescheduled, but at 8 am my mother and I decided to go........taking the only available train at 9:15 am. And we were off! Everything worked out really well. Got there at 2-ish. Carol picked us up at the front gate. Gene had shoveled the path at Land Hall with a DUST PAN so they could get their stuff in. They had gotten up at 4:30, shoveled for an hour and then drove in. Traffic was good so they got there in plenty of time. They grabbed all the cookies in the freezer but we were glad we were able to be there with 35-40 doz of our cookies. Not much was left at the end of the day. I am sending more this morning because Carol is concerned that this upcoming week will be skimpy~if not, she can reload the freezer. The plan was to surprise our son, Josh, and his roommate, Marcus, with our visit, as they share a birthday. Because of our delayed start we missed Josh coming through at the beginning of his calc class and he went off to swim class. But a friend went and got him later. I don't think he was that surprised then - I think he knew something was up! But he was pleased that I brought his birthday gift! We were able to spend about 15 minutes with him before he had swim team practice. I did meet Jared and Marcus Tebbs. 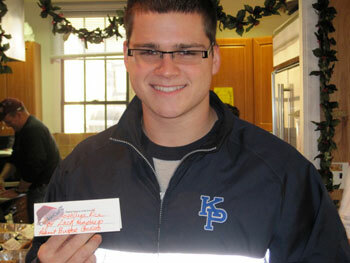 Marcus was very touched that we contacted his mom and helped to celebrate their birthdays. Later, Jared was to get the cake and take it to the boys' floor to share since we weren't able to stay for dinner. T here was also another birthday, Betsy Carbone's son. His mom must have sent something in his cookie basket because Carol gave it to him at Cookie Cafe. All the Mids were very appreciative. Best was the Mid who couldn't eat any cookies, but he brought a Christmas Cookie tin so he could keep his cookies until after Saturday's wrestling match. My mom is going to send you a cd with pictures for the website from both visits. Gene took us back to the train station at 5. Glad we caught the early train back to Penn Station because it was running late. I would have been a wreck if the later train was running late because there was only one train leaving Penn Station that night for Lancaster. Thanks for your help with all of this. It is an amazing ministry that Carol and Gene provide for the Mids! Here's the fun part - Midway through the afternoon we all noticed ONE Plebe scrutinizing every name that had been written on the cookie tent cards. He kept saying, “I know that lady, that lady and that one.” The mystery was solved! We had found the fellow who inspired the ladies back in Germantown, and we are happy that he did that. The cookies were delicious and it was a wonderful afternoon. Thank you, Ladies from Life Church!!! Another interesting thing happened. 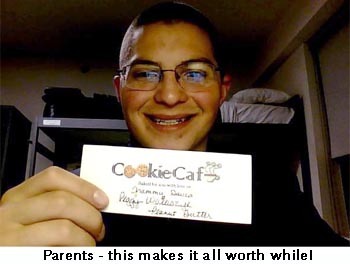 A professor told his math class that they were going to meet at Cookie Café for their class. As you might imagine, that was a big hit and he really made kudos with his class. After they quickly enjoyed the treats that they usually miss everyweek, they went upstairs in Land Hall to finish the class. While visiting their Midshipman, Sharon Scott and her husband dropped by to see what Cookie Café was all about. I recognized the name instantly as Sharon has sent cookies before. The couple left Kansas very early to make it in time. Sharon has become SO inspired about baking, her husband bought her a commercial-sized KitchenAid mixer for Christmas! Sharon said she is ready any time we need her to bake. Betsy Carbone, one of our regular Moms that helps every week was on jury duty, so we were short handed. By 2:30 pm all the helpers had left except my husband, Gene, and me. Just the two of us managing the Cafe brought back many memories of the way it used to be. We were very busy! I remember originally being a one-man show, transporting everything in the car, unloading, setting up tables, putting out the beverages, baking in the kitchen, keeping an eye on supplies and needs. Then the cleaning up, loading my van and driving 42 miles home at the end of a long day. But now, even though our numbers are much higher (350 this week), it actually is much easier for me. We are a “well-oiled machine.” We now have two cabinets to store everything, a freezer, and volunteer parents who roll up their sleeves and are a team with us. It’s finally at a place of being fun. It has the momentum of lasting a very long time as long as the parents want this to continue. The other day my postman left me a note that I had a package. I wasn't home so I had to go to the local Valley Cottage post office to retrieve it. When I handed in the slip the woman behind the counter said, "Carol Guest - I know what that box is! In fact this whole post office knows what your boxes are!" Of course, they are cookies. Each day, the UPS man gets the biggest kick out of trying to figure out what kind of cookies he is delivering. One day he told me that I must be getting molasses cookies, because the box was so heavy. Several days ago, when I opened the door, he stood there looking surprised. "Guess what, I think I have a box for you that doesn't have cookies, how can that be?" Gene has seen both FedEx and UPS back their trucks onto our driveway at the same time to deliver loads of boxes. Now they are asking if we are not home, can they open our garage door and put them inside so the cookies stay safe! By the way, we had a wonderful Cookie Cafe with a lot more parents visiting from out of state. Cathy Kinsella and Meg Wiseley, Kristie Sindorf and her mom Betsy King and Susan McDermott and her sister Auntie Babe. And this time one of the adminstration, Captain Larson, was walking through Land Hall and stopped to see what was going on. He didn't know about Cookie Cafe. After staying a long time to get his own cookies he asked me where did all the cookies come from. I was happy to explain to him what you parents are doing each week, and that the cookies come from all over United States. He remarked that was a lot of cookies to buy. I corrected him and said "Store-bought cookies are not what the parents send, they are all home baked." "FROM SCRATCH????" he asked, very shocked. "Yes, these are parents who love our Midshipmen." He was duly impressed. What is so much fun to see is the imagination and variety of cookies that arrive week after week. We don't tell you what to bake but there is such a fantastically different group of cookies every time. Last week, I don't know how many students told me how good the cookies tasted. They love them. Thanks, parents and friends, for your hard work, and your continued support in baking. It's wonderful! Thursday morning arrives early for us as we get up at 5am to finish packing the car, shower and exercise. On the road at 7am we arrive at 8am in time to get Land Hall ready for the big day. Cookie Cafe was just perfect. We started 8am to set up the tables, bring out the baking equipment, make up the lemonade, coffee, and hot water. At 8:30am Ellen and Larry arrived. They have been coming regularly and are hard workers and such an asset. Ellen started baking and Larry set up the tables, chairs and tablecloths. At 8:45am Betsy Carbone, a registered nurse, and mother of a Plebe son comes in to help us unwrap the boxes of cookies. We catch up on the week's news and have lots of laughs while we work. At 10am Larry takes our orders for coffee, and we have a little break. By 11:30 we have at least 30-35 aluminum bins of cookies unwrapped, labeled and covered - all ready for the Midshipmen. Gene and I leave to pick up the lunch for the Band of Sisters girls at Delano. We drive to the chapel, and spend 1/2 hour rushing to put out the food and beverage and set up all the chairs we can find in the lower chapel lounge. The girls, half the girls on campus, come streaming in at noon. I love to hear them come in - all female voices, all talking and laughing together. Gene leaves and goes back to Land Hall to finish up, wait for students and start the relaxing music playing. At 1pm another steady helper arrives, Johanna Essex, the wife of a 1954 graduate. The students start streaming into Land Hall to enjoy some relaxing time talking and visiting. This week a whole group of seniors came in together and Gene met an unusual student amongst them!!! One who had never been to Cookie Cafe!!!!! I didn't think there was any student left who had never been to Cookie Cafe. He looked surprised and amazed. His friend who brought him said "See, I told you!" He will be back, they always are. There was a steady stream of students from 1pm to 5:30pm. There are many comments that range from "thanks," and "you have no idea how important Cookie Cafe is," to "I waited all week for Thursday," and "it's so nice for parents to care." The Mids always look at the tent cards to see who made the cookies and if they know their son or daughter. The Assistant Commandant dropped by to get some cookies (yes the administration are regulars!). He looked around so surprised at how many students were there. I said to him, "Do you know what Cookie Cafe is doing for the Academy? It's building morale." He looked around at the obviously wonderful atmosphere and had to agree with me. This week, Anny and Gregg Swanson flew in from Chicago to help with Cookie Cafe and just look at first-hand how the cookies are being received. She really enjoyed herself and realized this is something the parents are doing that is such an asset on campus. The parents in Anny's association have gone off the chart with their unending support and we are so thankful! We cleaned up from 5:30-6pm, packed our car and drove home very tired but smiling. We had 337 students come. We had the perfect number of cookies, and gallons of milk, and everyone was happy. It is worthwhile, and it's fun to be part of it. December 10th was a wonderful time! The Christmas music was playing, hot mulled cider in the crockpots brought a wonderful aroma to Land Hall, the smiles and laughter of Midshipmen as they spent hours visiting with each other, and the wonderful cookies from home. Let me share what I think exemplifies Cookie Cafe in a nut shell. A Midshipman rushed in and started searching vigorously through the cookies. I asked, "Can I help you?" "I need to find my Mom's cookies," he answered as he went quickly through the containers looking at all the tent cards for his Mom's name. Then he found THE COOKIES and a huge smile broke out on his face. "There they are!!!" He grabbed a plate and started piling and piling his Mom's cookies on his plate with great contentment. You see, his Mom had baked LOVE, wrapped that LOVE so carefully so it would arrive in good shape, then mailed LOVE, and her son got the message. He found HIS MOM'S LOVE in the cookies she had sent. The Midshipmen get the message loud and clear!!! We had a special day with Pam Bianco, a mother from Florida, who worked hard to make it special once again like she did last year. She brought gingerbread kits for the students to decorate. She found a choir to come from a local high school, who treated us to great singing. She also brought beautiful porcelain snowflake ornaments and colorful Sharpie pens. The Midshipmen spent hours decorating them for girlfriends, mothers and sisters, and for their own rooms. The students singing Christmas songs sounded great as the Midshipmen sang along with the words printed out to many of the familiar holiday songs. This season, I want to send out a very special thanks to many people, who make Cookie Cafe what it is. There are faithful parents who show up early in the day to help us unpack the cookies, set up tables, clean, and are there for any needs we have. Muffi Grinnell for her tireless organizing, answering questions, looking after the website, and taking care of any cracks in planning that come along. I want to thank each one of you Moms, Dads, Grandmothers, Sisters and Brothers, Aunts and Uncles, and Friends, who work so hard and long sending your favorite cookies from home to the students. Also, I want to thank the students for the sheer joy they have given us with their smiles, laughter, hugs, contented looks, and relaxed atmosphere they create every Thursday afternoon. We see the students all the time at their most challenging moments, and still, Kings Point has some of the very finest men and women in the Nation. They are polite, courteous, patient, well-mannered, articulate, and just plain wonderful. Their personalities and the way they look at life are so much fun. I love them all and I am very proud of them. I want to commend all the parents who have done such a wonderful job in raising them. You should pat yourselves on the back! 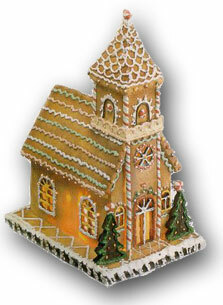 Our numbers have ranged this year from 275 to 475 and we had almost 400 attend the Christmas Cookie Cafe. So, keep the cookies, brownies, and bars coming. They are eaten up, and they are an encouragement to the Midshipmen. The message of love in every cookie is received and welcomed. These students look forward to Cookie Cafe, and the morale is greatly improved through your loving efforts. - Thanks, from MOM Guest. 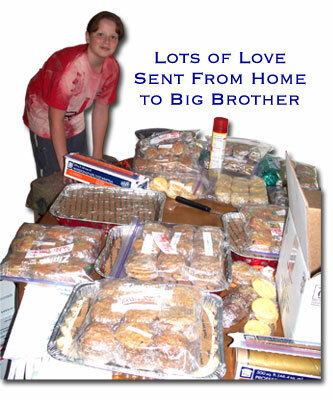 We had an unbelieveable amount of cookies from the Mid-Atlantic Association - THANK YOU! Cookie Cafe was packed with 434 smiling, relaxed students coming in all afternoon. It was the break they needed just before facing finals, which some have already started. The cookies were wonderful, with many students going back for seconds. Just so you get the picture, these are not students who are trying to be polite by taking one or two cookies, these students totally fill up their plates, and enjoy every minute of emptying the plate (female and male!). I guess we have created something very special and unique. Yesterday, I was told that West Point is sending down a group to observe Cookie Cafe, and see if they can replicate it at their Academy. There was talk that I could start a Cookie Cafe at West Point, as we live very close by, but our hearts are with the Kings Pointers. Parents - ALL of us together, have created something very unique and special. There is a "three legged stool" of Muffi coordinating sponsors, you parents and friends baking and sending the cookies, and me doing the work at the Academy. 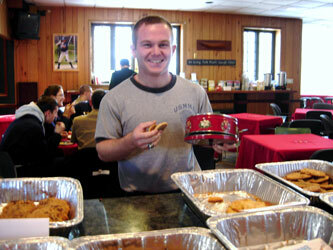 We have created a smooth, efficient, wonderful Cookie Cafe for the Midshipmen. You should pat yourselves on the back. Public businesses ought to take note at how smoothly, efficiently and cost-effective we run our Cookie Cafe "company!" Yesterday USAA Bank was in the front of Land Hall during Cookie Cafe, available to talk to the students about loans. The representatives are absolutely amazed at the event and took lots of pictures of what was going on inside. They told me that they go to all the academies and top schools in the nation, and no one has what Kings Point has: a Cookie Cafe to collectively reach out in love to the students. They think it's the greatest thing. I am very appreciative of the parents who have started coming early in the morning to Land Hall to help unpack all the boxes of cookies. We bring boxes from our freezer at home, and we fill the freezer we have at Land Hall. It takes Gene and me plus the volunteer parents about 3 hours to get the cookies out in containers for presentation. I always smile when I see how well the cookies travel. Thank you so much, all you bakers, for following the instructions in the website on how to pack the cookies. When I open a bag that is just crumbs, I feel so badly for the students, and for the parent who worked so hard to bake the cookies. That is seldom happening anymore and it's wonderful. We have slowly been working out the problems in this whole system. Thanks for your cooperation. Just a quick comment on another area. In the Middle of Cookie Cafe, the Commandant walked in to get his cookies. He announced to me that Band of Sisters has been reinstated at lunch hour. For those of you who don't know, my husband and I are involved in many other areas at Kings Point. One of them is my concern for the women on campus, which developed into a group called "Band of Sisters." Over half the women attend and it is making a much-needed difference. It was cancelled recently and a lot of effort went into getting it started again. So, I just want you all to know that Band of Sisters is again functioning for the girls. Hearing the good news was a VERY special "cookie" for me at Cookie Cafe. After working with Carol Guest for about 2 years on the side of coordinating Cookie Cafe sponsors, I FINALLY had the great fortune to visit and see it all for myself! Three a.m. came early to catch a 5:45 flight out of Richmond, VA, but I made it to NY by 7a.m. so Carol and Gene could swing by the airport and pick me up on their way to start their day at Kings Point. Talk about prepared! They were waiting for me right there at baggage claim with a fresh bagel and orange juice (and was I ready for it!). We arrived at Land Hall about 7:35, and began to open the many boxes of cookies that arrived for the big day. What was especially nice about being on the "this end" of the process was seeing how the cookies all arrived in such good shape because they were all packed so carefully. I got such a big kick out the notes that many of the LAKE MICHIGAN parents included to Carol. It's so wonderfully personal. Beautiful little messages and notes of cheer- for the Cafe Helpers and Mids alike. In short order, Land Hall was transformed: bright red tablecloths were spread all around, and coffee, lemonade, hot chocolate, tea and milk were layed across the back wall. It was a cold and rainy day outside, but the cheer inside was warming us all as we bustled about to open the Cafe. As many times as Carol has emailed me heart-warming accounts of the day, it couldn't quite compare to actually being there. The Mids started streaming in right at 1p.m., shaking the rain off their jackets and rubbing their cold hands together for warmth (or was it in expectation of that plateful of goodies!). Each student scanned the room for Mom Guest, and greeted her with a big smile and a hug. Ahhhhh...the relaxing began. Friendly, engaging chats hovered over the tables filled with happy students as they delightedly ate things like peanut butter monster eyeballs (? ), delicious breads and freshly baked gooey cookies. The kitchen was humming with activity as Cafe Helpers and Mids whipped up batches of fresh cookie dough and turned out pan after pan of the specialty of the day. One thing I noticed, although every student was looking wondrously over the vast array of cookies, I could tell with absolute certainly which students were Plebes. Their faces literally lit up with delirious glee as they heaped their plates with a gorgeous assortment of memories of home. It's a tremendous amount of work - pulling off a successful Cookie Cafe, but to see the happiness that it brings week after week, makes you want to roll up your sleeves, turn on the oven, and dive into the flour bag for another round. These kids are just the best! My stepfather Steve, my daughter Kate, and my son’s girlfriend Angie accompanied me on the trip down Thursday morning. Traffic wasn’t too bad, considering it is the beginning of summer road repair season. We arrived at 11:15, and after getting by the guard at the gate, we proceeded to Land Hall to drop off the fifty dozen cookies we had in the car. Upon walking in, we were met by Cookie Mom herself, Carol Guest, and her wonderful husband, Gene. You cannot get away with a handshake with this woman  a hug is the proper way to greet her. She already had the tablecloths set up, and the coffee/tea bar ready to go. We all proceeded to set up the trays of cookies, all labeled with the type of cookie and the family that baked them. We ended up with over 120 dozen items! While Carol went to lunch with the female Midshipmen ("Band of Sisters" - a wonderful support group), one of the Midshipmen came in and started whipping up a batch of toffee brickle cookies, since it is essential to have the smell of baking cookies to make mouths water. We were ready to go early, and the first ones came in right at 1300 hours. Their eyes literally lit up, and there were huge smiles on everyone’s faces. There were comments ranging from how they had never seen so many cookies to how nice it was that we had come down to help out. I must say that as parents, we should all be so proud of how polite and well-mannered our kids are. Quite a few came back after eating to thank us again. 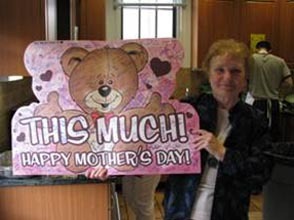 I can see why Mom Guest is so happy to do this for them  she gets paid back a hundred-fold in hugs, smiles, and love. To the right is a photo of her present from the Mids. We also had the pleasure of meeting the superintendent, Rear Admiral Allen Worley (very personable) and his wife, Margena, who is a real gem. She helps out at the Cookie Café as well. Watching her talk to the female Mids, I saw that she had a real rapport with them. The Chaplain, the down-to-earth and friendly Lt. Sias, was there as well, helping out. After four hours of mingling and talking and telling Mids to fill their plates or bring some back to their friends who didn’t make it in, we finally cleaned everything up and hit the road. What a wonderful experience! Thanks to all of you who helped us out. 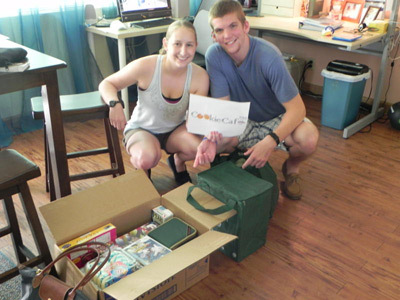 As a group, we succeeded in bringing a little bit of home to our loved ones, and they certainly appreciated it. And we all should be grateful for Carol & Gene Guest and Muffi Grinnell for putting in so much time and effort to provide such a wonderful relaxing place for them to go every Thursday afternoon.